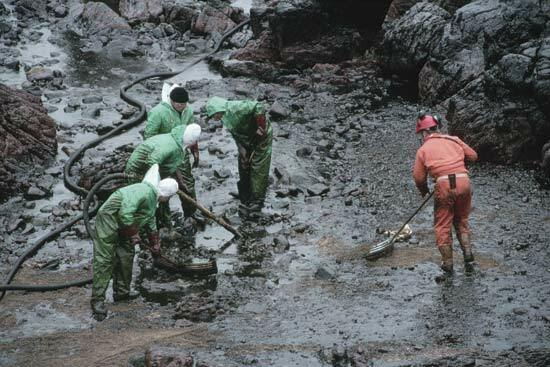 Develop a spill clean-up plan, and train staff regarding clean up procedures. The plan may be simple but accurate, indicating the role of staff members in the event of a spill and the location of clean up materials. Accidental spills are often a common occurrence within an industrial workplace. If not controlled, spills and leaks can pose a serious threat to the environment and safety of personnel as they often lead to storm water pollution or hazardous situations. For large scale hazardous spills, contact the Fire Brigade (999) immediately for assistance with clean-up operations. Stop the source of the spill immediately (if safe to do so), appropriate to the chemical type (refer to data sheet). This will reduce the level of contamination and impact on the environment. Control the flow and contain the spill appropriate to the chemical type (refer to DATA SHEET). Prevent the spill from entering the storm water system by isolating or blocking off drain inlets. If a spill occurs where pollution causes or threatens material harm to the environment then you must notify the Appropriate Regulatory Authority (ARA)as soon as you can after you become aware of the incident. It is an offence under the Protection of the Environment Act 1997 not to report the spill in these circumstances. Develop a spill clean-up plan, and train staff regarding clean up procedures. The plan may be simple but accurate, indicating the role of staff members in the event of a spill and the location of clean up materials. Dry Cleaning is recommended to prevent spill flowing into storm water inlets. It involves using absorbent material such as absorbent granules, sand, saw dust or flour to mop up spills. There are numerous products available commercially which promote this absorbent cleaning method.